After exploring Holm and South Ronaldsay the previous day I decided to visit the West Mainland this time. It has a lot of historic sites to visit, I started with Maes Howe. 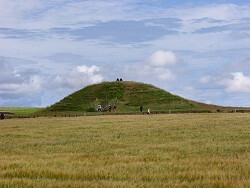 Maes Howe is one of the most impressive neolithic burial chambers in Europe. 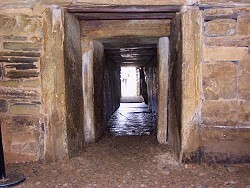 It was built before 2700 BC with the tomb aligned so that the sun shines exactly down the passage at the winter solstice. 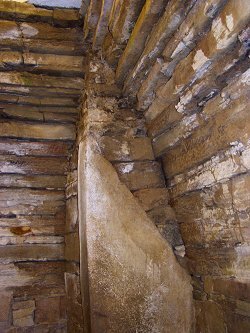 Not much was found inside the chamber when it was opened in 1861, as it was plundered by vikings in the mid-12th century. However, the vikings left something else behind: Large amounts of runic "graffiti". They form the largest collection in the world of runic inscriptions to be found in one place. The runes spell out various phrases, from claims of being written by the most skilled man in carving runes to information about hidden treasures. Most of them are still clearly visible, although it is quite difficult to take pictures of them. 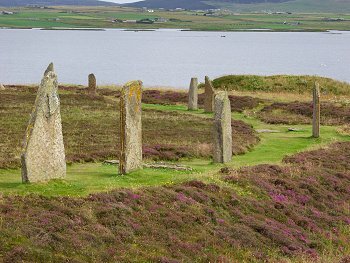 Next were two stone circles: First Stenness Stone Circle, then Brogar (pronounced Brodgar) Stone Circle. Both can be seen from Maes Howe (and vice versa), as they are only a short distance apart. 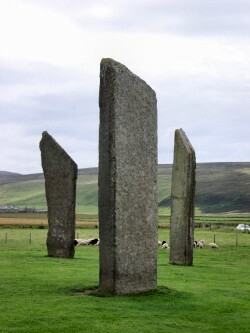 Stenness originally consisted out of 12 stones, of which only 4 remain. The remaining ones are very impressive though, the tallest one being more than 5 metres high. Brogar originally had 60 stones, of which 27 now remain. One was hit by lightning fairly recently, causing it to shatter. This might have happened to other stones in the circle as well, possibly explaining damage to other stones in the circle. There are also several single standing stones in the vicinity of these two circles. 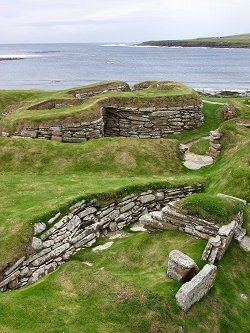 The last historic site I visited for the day was Skara Brae, and I wasn't the only one. The place was packed with tourists, making it difficult to take any good pictures. 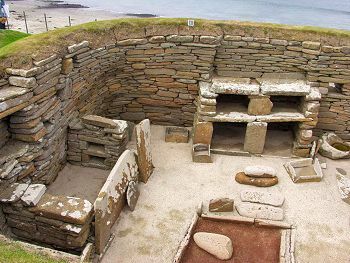 Still managed to take a few though of this neolithic village discovered in 1850 in the Bay of Skaill. It consist out of five houses, each of them with just one room. The rooms include built-in cupboards, beds etc, all made out of stone. 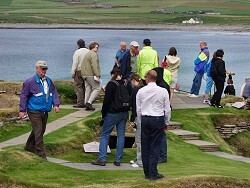 Due to the number of tourists visiting the site it is not possible to explore the houses themselves, it is only possible to look down from the outer walls.